During the night of 27 April 1944 a de Havilland Mosquito night attack fighter from 613 Squadron was airborne for a raid on the German fighter airfield at Vliegbasis Twenthe (Dutch: Twente Airbase) in the eastern border area of the Netherlands. The Mosquito was on an intruder mission, a low-altitude strafing/bombing run on a fighter base in the darkness. Coming in low and from the east the Mosquito was only two kilometers from the Luftwaffe base when (according to local accounts) search lights were switched on and anti-aircraft fire began, blinding Flight Sergeant R. J. E. Adey and his copilot K. J. Pinnell, who were brought down into the trees in the Haagse Bos (Dutch: Haagse Woods), both men dying during the crash. DeHavilland Mosquito FB.VI of RAF 613 Squadron at RAF Lasham, June 1944. This photo was taken two months after the crash in the Haagse Bos. 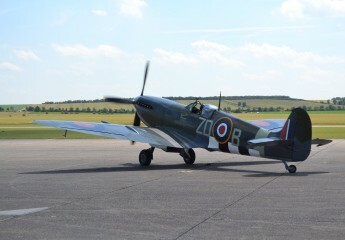 Notice the Recognition or “D-Day” stripes on the aircraft. By Ringwayobserver – Licensed under CC BY-SA 3.0 on Wikimedia commons. This area, the Haagse Bos, happens to lie near my in-laws home in Enschede, the Netherlands, and as the years have passed, I have often found myself hiking in the woods. A small wooden marker on the path, near the forest where the Mosquito crashed on 27 April 1994 is there to remind us of the sacrifice by these two men on a night-time raid in a almost completely wooden, high speed, light bomber. I felt compelled to learn more about the crash. I wanted to find the spot where the plane went down, aware that very little of the aircraft would remain, since the de Havilland Mosquito was designed for speed and was mostly a wooden construction bomber built around a metal frame. I’ve oriented the below photographs onto the aerial photo from the late 1940s mentioned. #3 is the location of the Mosquito crash site. The photograph is oriented with North at the top of the photo, the Vliegbasis Twenthe is 2 km WSW of the crash site. Aircraft archeology efforts paid off quickly, as the sacrifice of the two British fliers who crashed here in 1944 were quietly honored at the time and have been respectfully remembered by the citizens of the Dutch city of Enschede since. An aerial photograph from the late 1940s identified the crash site, approximately 150 meters from a small wooden marker that records the crash. From there, using the overhead photo and a picture from the 1980s which shows scarring in the trees from the Mosquitoes’ crash, I could vector in on the site. It was during these exploratory efforts that we discovered a fresh bouquet of flowers last April, on a cold afternoon, lying next to the wooden marker near the site. The flowers were a moving, quiet act of gratitude to the two men who flew the aircraft from an anonymous person, left 71 years after their death. This aerial photograph shows the area from above, taken in the late 1940s, and is the one which allowed me to locate the site. At the time, the scaring in the trees from the Mosquito’s impact and fire was still visible. (Remarkably, in the early 1980s, scarring in the trees was also mentioned in a local Dutch newspaper with an accompanying photograph, but by 2015 to 2016 I could not discern any noticeable change, most likely since some timbering took place in the area after the 1980s story). The photos I’ve taken with my camera are numbered, with the number corresponding to a place on the aerial picture where I stood taking the photo. The v-shaped arrow shows the direction of the photograph, to help orient the ground images to the overhead photo. The location of the plane’s final position is a close approximation, since debris was likely spread as the plane hit the trees at high speed, but this final photo is the location of the wreck and visible damage to the woods from 70 years ago. Picture #1, looking north into the Haagse Bos, south of the crash site. © Brandon Wilgus, 2016. Photo #2, the crash site is ahead. The wooden marker honoring the two lost aviators I mentioned is in the foreground. © Brandon Wilgus, 2016. Picture #3, the crash site. Due to the Mosquitos’ almost all wood construction, little of the aircraft remains. © Brandon Wilgus, 2016. Picture #4, the path into the Haagse Bos. © Brandon Wilgus, 2016. A few kilometers east of the crash site is Vliegbasis Twenthe, which the Royal Netherlands Air Force maintains as a fighter divert airfield. During the Second World War, the Luftwaffe used the airfield as a Messerschmitt BF 109 fighter airfield: the target of the Mosquito’s low altitude night-time raid. Maintained and used by the Dutch Air Force since World War II, there are several anti-aircraft hardstands, pill boxes, and firing positions from the time it was used by the Luftwaffe which still survive. On the roof of one of the WWII era Luftwaffe pillboxes at Vliegbasis Twenthe is an extremely well preserved anit-aircraft gun. I am unable to identify this weapon besides seeing that it is a light anti-aircraft gun on a rail mount system. © Brandon Wilgus, 2016. A Luftwaffe pillbox from the Second World War on Vliegbasis Twenthe, © Brandon Wilgus 2016. The Inside of the bunker, the excellent state of preservation is likely due to the pillboxes still residing on the Royal Netherlands Air Force Base, Vliegbasis Twenthe, with little public access. © Brandon Wilgus, 2016. Flight Sergeant Adey’s gravestone. Thanks to http://www.vliegtuigongevallen.nl. After the plane crashed, locals removed their bodies which were later identified and interred in a local cemetery. Flight Sergeant Royston John Edward Adey was 21 years old at the time of his death. His parents were Ronald John Edward Adey and Edith Rose Mary Adey, still living in their family home, Winshill, Burton-on-Trent in Staffordshire. In St. Mark’s Parish Church in Winshill there are two boards marking the names of men from the village who fell in the First and Second World Wars, Flight Sergeant Adey’s name is memorialized there. His final resting place lies under a Commonwealth War Graves Commission marker in the Oosterbegraafplaats Enschede, the Netherlands. Flight Sergeant Pinnell’s gravestone. Thanks to http://www.vliegtuigongevallen.nl. Several very helpful Dutch webpages assisted me in this blog post and aircraft archeology effort: http://www.luchtoorlogboventwente.nl/440427RAF.php, and http://www.secondworldwar.nl/enschede/luchtoorlog-vliegveld-twente.php#.Voe7-VgrHIU, thanks. – Brandon.